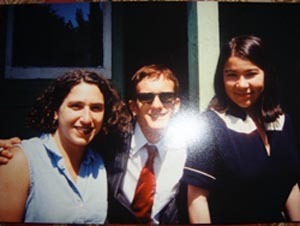 Brenda Shaughnessy (right) shown as a student at UC Santa Cruz in the early 90's. 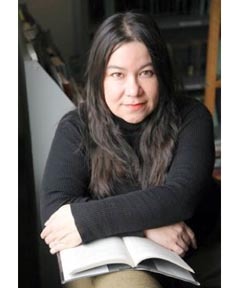 UC Santa Cruz 1993 graduate Brenda Shaughnessy has been awarded a 2013 Guggenheim Fellowship for the creative arts in poetry. She is one of a diverse group of 175 scholars, artists, and scientists who were selected this year by the John Simon Guggenheim Memorial Foundation from a group of 3,000 applicants. Shaughnessy’s most recent collection of poetry is Our Andromeda (Copper Canyon Press, 2012). Now living in Brooklyn, Shaughnessy is currently poetry editor-at-large at Tin House Magazine. She is also the author of two other poetry collections: Human Dark with Sugar, which was a finalist for the 2008 National Book Critics Circle Award; and Interior with Sudden Joy, a finalist for the Lambda Literary Award. Her poems have also appeared in such renowned venues as Harpers, McSweeney’s, The New Yorker, and The Paris Review. Two decades ago at UC Santa Cruz, Shaughnessy was also a student of Feminist Studies professor Bettina Aptheker. Aptheker noted that Shaughnessy will give a poetry reading on Thursday April 25, at 6 p.m. in the Humanities Lecture Hall as part of UCSC’s Living Writers series. She will also participate in a luncheon with UCSC undergraduate students at the Ethnic Resource Centers on April 26th from 11:30 a.m. to 1:30 p.m. at their Bay Tree offices. Shaughnessy will additionally present a talk titled "Feminism & Poetry, Empowerment & Passion," and appear on a faculty panel to discuss the latest developments in UCSC’s Feminist Studies Department--including the launch of its new Feminist Studies graduate program, the UC Presidential Chair in Feminist Critical Race and Ethnic Studies, the current curriculum, faculty research, and more—on Saturday, April 27, from 2 to 6 p.m. at the Humanities 1 building, Room 210. “We welcome everyone to these joyous opportunities to hear a truly great poet share the passion and love of her work,” said Aptheker.